Damn.... I really should have sucked my gut in for this one... My sons look considerably slimmer than I do. Not often that I persuade the boys to participate together. Makes a pleasant change. "Let me die a Youngman's death"
50 years old this week..... Yippee? Normally I don't bother too much about age, feeling old, mortality etc etc, but the whole "celebration" of this milestone (we have a party & BBQ planned) seems to make me think about it now. 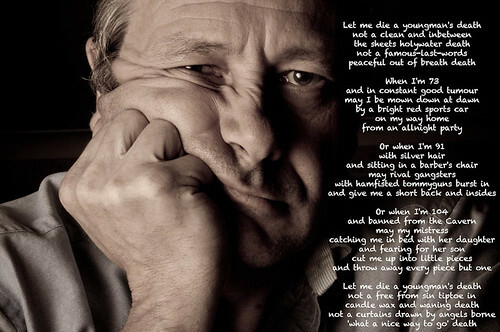 The poem describes exactly the sort of feelings I would prefer to have about ageing & mortality. The poem is by Roger McGough...... He has some other wonderful & droll poems as well. If you have not read any of his, then take the opportunity to do so if you can. Got my son to pose again. Nice to have a cheap, willing & photogenic model on call.